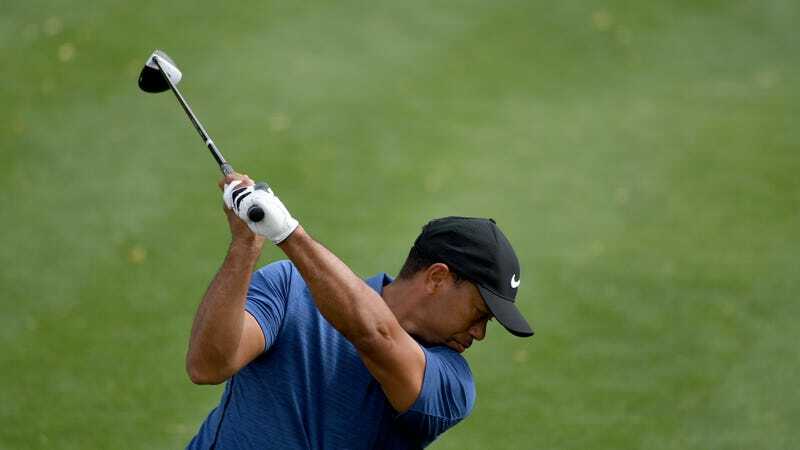 Tiger Woods played in a foursome Saturday at Trump National Golf Club in Jupiter, Florida, with current world number one Dustin Johnson, idiot President Donald Trump, and Brad Faxon, a PGA Tour Champions player and Fox Sports golf analyst. These casual rounds have taken on real meaning as Tiger gears up for his first professional appearance since February, next weekend at the Hero World Challenge, in the Bahamas. I was impressed with how far he hit the ball. Probably on the 10 holes that they were both hitting driver, Tiger hit it past Dustin half the time and Dustin hit it past Tiger half the time. Consider that Dustin Johnson finished the 2017 PGA season ranked second overall in driving distance, and smoked a monster 439-yard golf dinger in August. Tiger was once a smoker of golf dingers, himself—in 2005 he finished second in driving distance, with an average distance (316.1) longer than Johnson’s 2017 performance (315)—but that was a long fuggin’ time ago! If 2017 Tiger can hit with Dustin Johnson, that’s, umm, impressive! Tiger looked like he had all the touch shots down. On the very first hole he hit a pitch shot over a bunker that looked great. Hit some tough little pitch shots, tough chip shots and hit some close. Some to gimme’ distance. As for our totally honest 73-shooting President, he and Faxon apparently played from the blue tees. No mention is made of the President’s heroics, which I’m sure will cost Faxon dearly in some future endeavor.